On January 20, 1997, a so-called "Student Coalition" marched from Showalter Fountain to the Sample Gates, demanding action on a variety of issues. 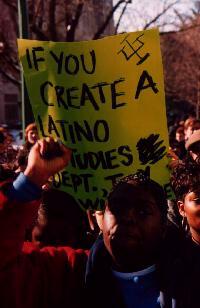 Their demands included the following, according to griot: The approval of a Latino Studies Department, The appointment of an Asian-American Advocacy Dean, The maintenance of the Office of Diversity Programs, University funding for the GLB center, creation of an Asian Culture Center, an increase in nonwhite and women faculty, and university recognition of Martin Luther King Jr. Day. The march itself drew far less than expected. The Indiana Daily Student reports the Coalition expected 1000 people to march, but only about 400 marched, according to the IDS. This is less than half of the expected goal, on a day of relatively warm weather conducive to such a protest. Hardly a major statement on a campus of over 30,000 students. As to the demands of the Coalition, Hoosier Review must oppose these proposals. The demand for more nonwhite and women faculty sounds suspiciously like a quota. HR believes positions in faculty, including professorships, should go to the most highly-qualified individual. To hire professors simply on the basis of skin color or gender without regard to qualification is an insult to students who spend thousands of dollars on an education. Students deserve the best, and I.U. has an obligation to hire the best. The demands for more nonwhite and women faculty also seem to be in conflict with the original dream of Dr. King, for a color blind society. King's dream of a society where everyone is free to be the best he can be without regard to race or gender are being subverted by these demands. If the Coalition is serious about honoring Dr.King's legacy, they should withdraw this demand. However, the most troubling aspect of the Coalitions demands, is public funding for the GLB culture center. For students of religious faith or who observe traditional Judeo-Christian values, this is a direct slap in the face. While many people will tolerate behavior they disapprove of, these same people would take strong opposition to their money being forcefully taken from them in order to "educate" about something they disagree with. After a lengthy battle in the Fall of 1994, this Center was denied public funding, and has survived for two years on private donations. The Center should continue to operate on private donations rather than forcing all students to contribute to it. Hoosier Review strongly advises the I.U. administration to strongly consider their impending actions. There was almost no public debate on these issues, except for the protest itself and lobbying those who support the demands. Since conservative voices on campus were largely ignored in this debate, the I.U. administration should open the debate to the entire university and allow conservative students to have their say. Hopefully, the University will seriously consider these issues and think of all students before making a final decision.